Without a doubt customer success management is a hot topic right now. Businesses of all kinds realize that if they wish to keep a hold of their customers and win further business from them they must be able to help those customers to realize measurable value from using their products and services. Whilst there are several excellent books that are aimed at helping business owners and executive decision makers with developing a customer success strategy, there are far fewer options in the way of best practice guidance for the CSMs themselves and practical resources such as tools, templates and checklists to ensure consistency and quality of approach whilst increasing productivity and efficiency are even harder to find. Practical Customer Success Management: A best practice framework for managers and professionals provides a simple-to-follow best practice framework that explains the core steps at every stage of the customer journey to business outcomes success. It describes the situations each step applies to and provides detailed explanations and guidance for successfully completing all tasks related to each step. Included within this book is access to an entire series of downloadable tools and templates that enable rapid completion of tasks and ensure consistency of approach across multiple customer engagements. "Practical Customer Success Management" is a must read playbook for all business leaders and customer success-focused professionals. It imparts a solid grounding in what customer success is and why it is so important, whilst highlighting key challenges and how to respond to them. In addition it provides a detailed practical framework that explains both what to do and how to do it at every stage of the customer success engagement." "Practical Customer Success Management" is unique from any other customer success management book I’ve read in that it bridges the gap between the theory of customer success and the reality of actually implementing a customer success program. The templates provide the jumpstart needed to either stand up a new framework or to bridge gaps in an existing framework. This is a welcome addition to my customer success library!" "This book contains so much common sense that my neck was getting tired from nodding my head in agreement so often. As you read the material, and especially if you’re a seasoned customer success professional, you immediately recognize that it was written by someone with many years of deep experience working with clients. And I think that’s where Rick Adams’ book is differentiated from most of the other customer success content that has been published. He’s clearly coming at this from years of customer leadership in real life scenarios, from the trenches in which it seems he was able to work with customers week by week to help them methodically advance in their ability to adopt more of a product or service in order to achieve their goals. And that’s what customer success is all about." "As a relative newcomer to Customer Success, I have found this book to be an invaluable resource. Customer Success as a function within my organization is still in its infancy, and for that reason, there is much that remains to be built out and standardized. I feel as though we've done a good job of making the best with what we have, but I am someone that thrives when there is a structured roadmap to follow. That is precisely what this book offers, and does so with great detail. I found so many of the scenarios and examples to be extremely relatable, and the recommended processes highly applicable. I plan to implement Rick's framework not only to my day-to-day activities, but also to serve as our Customer Success team's playbook and guide." "I wish a book like this existed when I started in Customer Success! I’ve been in the role for more than half of my career and I was impressed with the book’s vast coverage of the multiple facets and nuances of the Customer Success position. ‘Practical Customer Success Management’ is a great foundational book for learning the principles and applications of Customer Success and a good practical guide, well laid out enough to be easily referenceable and easily digested." "This book provides a comprehensive review of the Customer Success role and responsibilities as distinctly different from overall customer experience and applicable to any business, not just SaaS. Onboarding, adoption planning, and adoption implementation are described in depth and there are immediately usable recommendations to execute each phase effectively." "An actionable and to-the-point "gospel" of customer success management. In his book, Adams not only clarifies what customer success management is, but he also provides all the ingredients to create the right customer success strategy. If you need to implement customer success within your own company, or if you are a CSM who simply wants an authoritative guide to customer success management best practices then dive in!" "It is refreshing to see a book that articulates easy-to-follow concepts of customer success management using real-life examples on how to perform the role more effectively and efficiently. 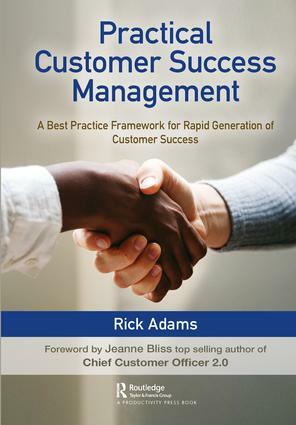 Adams’ style of writing is entertaining and very simple to digest, and what I particularly appreciated is the way in which he has broken down complex challenges and made them easy to understand for customer success managers to apply in everyday situations when serving their customers." "The growth of Customer Success as a corporate discipline has been remarkable and continues unabated. Rick’s excellent book is an invaluable resource for anyone with an interest in Customer Success. Whether you are contemplating your first foray into Customer Success or are a seasoned executive, this book provides both the framework and practical guides to help ensure that you have the best-practice structures and processes in place for both today and the future." "A structured and logical approach that will help new and experienced CSMs to bridge the gap between Customer Success theory and practical application." Acknowledgments. Who is This Book For?. Foreword. About the Author. Introduction. Chapter 1: An Overview of the Customer Success Manager’s Role. Chapter 2: Readiness for Customer Success Management. Chapter 3: Customer Success Management Tasks, Tools and Techniques. Chapter 4: Practical CSM Framework Stage 1: Preparation. Chapter 5: Practical CSM Framework Phase 2: Commitment. Chapter 6: Practical CSM Framework Phase 3: Onboarding. Chapter 7: Practical CSM Framework Phase 4: Adoption Planning Part 1 – Concepts. Chapter 8: Practical CSM Framework Stage 4: Adoption Planning Part 2 - Practice. Chapter 9: Practical CSM Framework Phase 5: Adoption Implementation. Chapter 10: Practical CSM Framework Phase 6: Value Realization. Chapter 11: Practical CSM Framework Phase 7: Engagement Evaluation. Chapter 12: Concluding Thoughts. Rick Adams is an independent author, trainer and consultant, specializing in helping companies of all types and sizes deliver measurable business value for their customers. Adams has over 25 years’ experience of helping companies to realize business success, including owning his own startup software-as-a-service business which he sold in 2012 to focus on writing, training and consulting. Over the years, Adams has delivered training and consultancy to many hundreds of businesses and thousands of sales, technical and customer success professionals in over 30 countries across four continents. His recent work includes the development and delivery of a global certification program on customer success management for Cisco Systems Inc. In addition to authoring many training manuals and presentations, he has written numerous technical articles for US-based and UK-based publications with worldwide distribution. He is now based in the rural west coast of Ireland where he lives with his two dogs Zeus and Terri. His current focus is on helping individuals and companies develop best practices in customer success management and in business outcomes focused selling.